FOR IMMEDIATE RELEASE – July 29, 2014 – Hospira, Inc. (NYSE: HSP), announced today it will initiate a voluntary recall of one lot of Lidocaine HCI Injection, USP, 2%, 20 mg per mL, 5 mL single-Dose Vial, Preservative-Free (NDC 0409-2066-05; Lot 25-550-DD, Expiry 1JAN2015) to the user level due to a confirmed customer report of discolored product with visible particles in the solution as well as particulate embedded in the molded glass container. Hospira has identified the particulate as iron oxide. To date, Hospira has not received reports of any adverse events associated with this issue for this lot. Hospira has attributed the embedded particulate to supplier’s glass defect. As a result of this issue, Hospira is working with its supplier on implementing corrective and preventive actions. Risk factors associated with the particulate include the potential for particulate to be injected and/or a delay in therapy. If the particulate goes undetected and solution is administered - depending on the particle size and number - it could block administration of the drug to the patient, causing a delay in therapy. However, this is an unlikely outcome due to the size of the subvisible particulates identified. It is more likely that particulates are able to pass through the catheter and may result in local inflammation, mechanical disruption of tissue or immune response to the particulate. While extremely rare, particulate exposed to strong magnetic fields (e.g. MRI), could potentially dislodge and cause tissue damage. However, the particulate size identified is considered too small. Therefore, an adverse outcome is extremely unlikely. 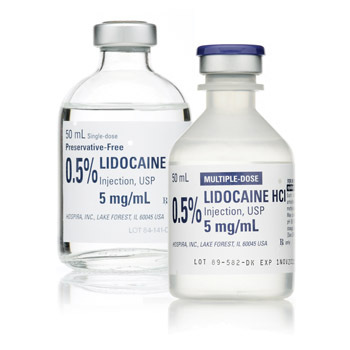 Lidocaine is packaged 10 units per carton / 180 units per case in single-dose glass fliptop vials. This lot was distributed nationwide to distributors/wholesalers, hospitals and clinics from June 2013 through July 2013. Anyone with existing inventory should immediately stop use and quarantine any affected product. In addition, customers should inform potential users of this product in their organizations of this notification. Hospira will be notifying its direct distributors/customers via a recall letter and will arrange for impacted product to be returned to Stericycle for returns processing. For additional assistance, call Stericycle at1-855-827-6586 (M-F, 8 a.m. - 5 p.m. ET).